East Tennessee offers exceptional trout fishing year-round. Ironically, most folks don’t believe Central Tennessee harbors any trout. Meanwhile, during the winter months the Tennessee Wildlife Resources Agency gives anglers 90,000 reasons to believe that statement isn’t true. While most stocking in Tennessee takes place from March through early summer, the TWRA continues it’s strong winter trout plants, which take place mostly between Nashville and Memphis, where spring and summer temperatures don’t support trout. 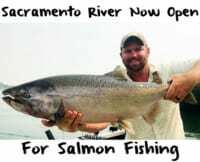 These winter plants begin in December and continue through March and provide an excellent chance at catching rainbow trout in areas you’d never believe they existed. Take Nashville, for example, a city that’s known for Country Music, not trout. More than a handful of rivers, urban lakes and ponds are planted monthly giving the 1.6 million residents of the greater Nashville area plenty of trout to go around. While there has been a lot of rain locally in January, and many rivers and creeks are higher than normal, we kept on course and arrived on site at Nice Mill Dam Recreation area in search of planted rainbows. Roughly a 20-minute drive from the Music City, this popular wintertime fishery near Murfreesboro and Symrna isn’t a secret to anglers. Even on a Thursday morning anglers littered the banks. Participation is high here and increasing annually as more folks become aware of the winter stocking program. The water was much higher than we expected, off color and turbid, almost to the point it looked blown out. Fortunately, we didn’t panic. Rather than feeling overwhelmed by the poor conditions and big water, we took time to dissect the system and attempt to figure out where the trout retreat to in high water. 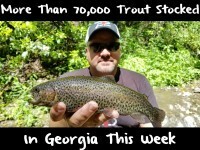 We knew trout were around, as the TWRA restocked the creek earlier in the week. When faced with high water trout historically retreat to areas that are outside the fast, main current. You’ll find them on the edge of seams, tailouts, in pools and behind structure, which provides a resting area and protection. We targeted these areas and caught easily limits of rainbows, while releasing most. It was a particularly special day for me as I was able to take my young cousins trout fishing (they live in nearby Franklin) for their first time. Even being their first outing they caught plenty of trout on their own after short lessons, proof these fisheries cater to all ages and angler skills. Nice Mill isn’t a beginner fishery, but can be tackled by newbies with the right gear. 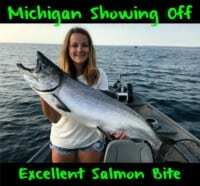 We caught every fish on Pautzke Orange Deluxe, Yellow Jacket, Silver Label and Gold Label salmon eggs. While a few anglers nearby used scented corn and hooked a few rainbows, we stuck to eggs and it proved to be the right choice. In three hours of fishing we hooked more than three dozen rainbows on small single egg hooks and four-pound test fished on spinning reels. It’s important to use two split shots to keep the eggs near the bottom. Otherwise, the current will force them out of the strike zone. After spending last week filming in Central Texas, we were impressed with the size of the planted trout available in the Nashville area. Texas’ trout were all smaller than 10 inches, whereas these Nashville bows averaged 10-12 inches and a few we caught pushed 14. Nice job, Tennessee. Your efforts aren’t being overlooked by anglers. You’ve done a great job with these stocked winter trout fisheries and our conversations with hundreds of anglers reflected that. Editor’s Note: Team Pautzke enjoyed college basketball games at Tennessee, Vanderbilt and Tennessee Tech, while in the Volunteer State. We recommend dining Papa Turney’s at Nashville Shores Marina, possibly the most overlooked BBQ in the state.